Hi everyone, here is an interview with the great Josh Rivera! Hi bro! How are you doing? Welcome to MasterTheHandpan blog! Could you introduce yourself please? Hello, David! It’s an honor to be part of MasterTheHandpan blog! Thank you for all you have given to this handpan world. So…My wife, Marie, and I moved from Minot, North Dakota to Asheville, North Carolina to join Saraz handpans in December of 2014. Her family has been farming for generations in ND and she was raised there since birth. My family landed in North Dakota in 1994 due to my Dad being in the military. Her and I were basically high school sweethearts, and are about to celebrate 14 years of marriage! We finally bought a house 2 months ago here in NC with enough space to have my workshop as well as some land to enjoy a few of our favorite things. We are hoping to have some bee hives soon, Marie will now have plenty of space to start a garden, and our 2 dogs are happy being out of the city. I am also an avid skateboarder and will be building a mini half pipe in the next few weeks on the land. Overall, we have been loving it here! Lots of waterfalls, mountains, good food, good beer and the best cider. I would never have thought North Carolina was such an amazing place when I was younger. Now it is hard to imagine living anywhere else! 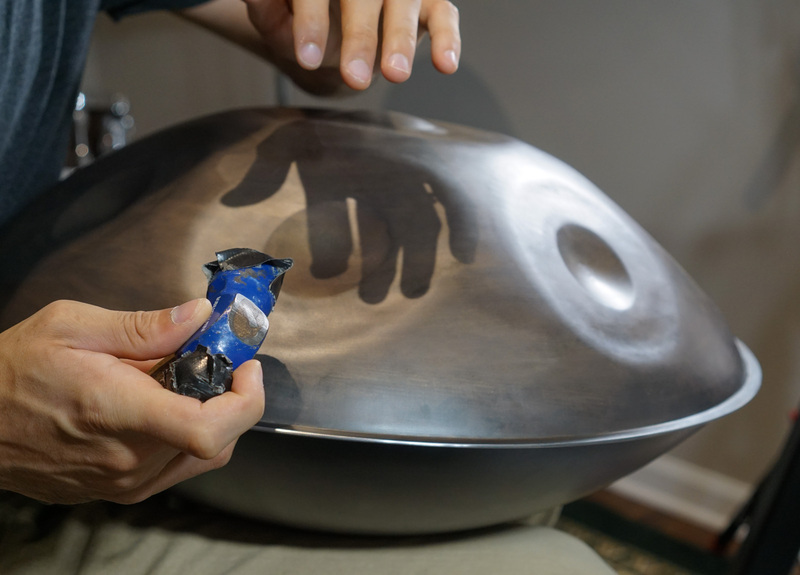 When did you start playing the handpan? How did you discover this instrument? The first time I saw this instrument was a 2nd Generation Panart Hang on YouTube in 2006. At the time, YouTube had just come out and I had my mind blown watching tabla players for the first time. After spending a lot of time getting lost in the world of eastern percussion videos and learning to play tabla and darbuka, I saw a tabla player playing the Hang. I believe his name was Gupreet Chana. My love and obsession with the instrument was instantly created. I spent the next week researching everything I could about the instrument with the intention of getting one as soon as possible. It was quickly apparent how hard they were to get. I then found myself on the handpan.org forum, which had a different name at the time. Through the wonderful people there, I was directed to a man named Ron Kravitz, who then directed me to Dave Kaetz. Dave would travel to Bern (the home of the Hang) and helped represent the English speakers who would visit Bern when Panart would open up their shop to sell instruments. As part of his deal, David was allowed to bring home a number of instruments to sell to those of us close to him. I remember emailing him and asking if I could be on his list to buy a Hang and then getting a phone call within 3 minutes of clicking send! He said he had one open space left on his list and that I had to send the money immediately to an address in Switzerland. I honestly thought I was being scammed, and that someone was just sitting around waiting for a sucker like me to take advantage of. While I was nervous about this unconventional way of buying an instrument I had only just learned about as well as sending money to a city and a person I had never even heard of, I did it anyway!! Haha! 3 months later the instrument arrived at my door. I believe this was the last year they shipped instruments. So, from the moment I first saw the Hang to the moment I had one in my lap was only 3 months, which was almost unheard of at that time. Luck and fate played a huge role there. Since then, the Hang and Handpan have opened a lot of doors and shaped a majority of my current life. After realizing there was only one person I trusted to tune my Hang, Kyle Cox, I started to think about the possibility of learning to tune. It was always in the back of my mind, but never acted upon. Then, one year at Handpangea in Gerton, NC, I met Colin Foulke who had just begun his path of learning to tune. He was the first inspiration that made me think that maybe, just maybe, I could learn as well. After having a conversation with him, he planted a seed and said “You seem like someone who would enjoy learning to tune”. In that same weekend, Mark Garner was also another builder emerging before the big explosion of builders. After a long conversation with him, he said almost the exact same thing. “ You seem like a personality type that would really enjoy tuning”. So, two times in the same weekend the seed was planted. I returned to my home in North Dakota and couldn’t stop thinking about their words. After some thought and conversations with Marie, we decided I should shut down my home recording studio and start to focus my free time on learning to tune. My original intention was just to learn how to tune so I could maintain my own instruments, and maybe others when I had enough skills. Learning to tune requires learning to build, and Colin and Mark spent a good amount of time mentoring me. I spent the next year sinking and shaping about 17 steel barrels by hand with a large wood mallet. The barrels I was able to get were 1.4mm thick! Not knowing any better, I just dove in not realizing most handpans are between 1-1.2mm. It was really hard!! I was able to successfully tune a few of them, and still have #2 in my shop as a reminder on bad days that I was able to figure it out then, I can figure it out now. After some time, maybe around the 15th barrel I worked on, I visited Mark for a week and he let me have a chance at tuning one of his junk shells. After gluing it together we were surprised that it indeed sounded like an instrument! We decided then that maybe we should schedule another visit for me to come out for a week and see how much further we could go. After my second visit Mark offered me a position to tune with the Saraz team. After living in North Dakota for 20 years, we made the move to Asheville, NC 3 months after that second visit. The timing was perfect as Mark had injured his back and I was thrown into the deep end and started tuning immediately. It has now been over 3 years since starting with Saraz and I have tuned more than 300 Saraz handpans. Could you tell us more about www.riverasteeltuning.com? When did it all start? How did you end up offering this service? 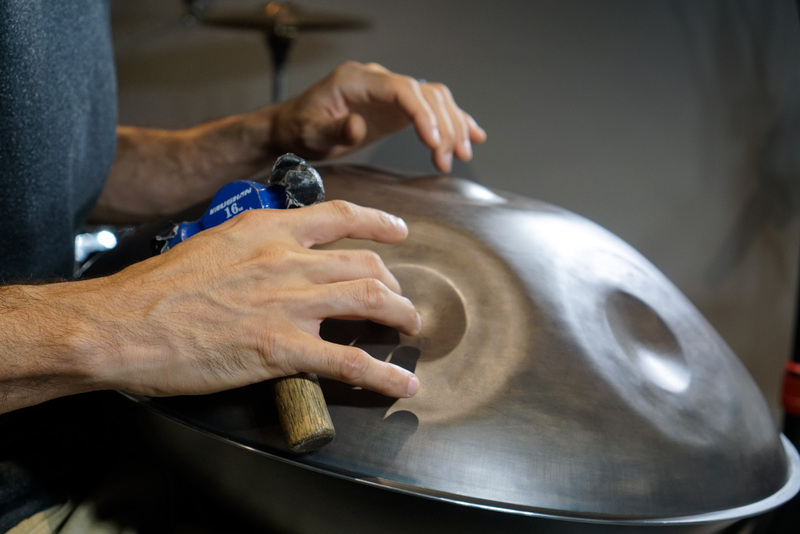 It is interesting as I feel I am coming full circle to my original intention, which was to offer tuning and maintenance for Hang and Handpan instruments. During this time with Saraz, I found myself attending festivals quite often and watching other skilled builders offer tuning. I always watched them intently and loved seeing the change in the instrument as well as the happy faces after a successful tuning. I started off tuning my own instruments of course, which was a 1st Gen Hang and an early Halo. I then tuned my Bellart. After that, I started to slowly take on a tuning request here and there when I was approached. I started to find that I really enjoyed working on the architecture of other builders as it was amazingly educational. With the rise of builders the number of instruments in the world has been increasing dramatically. Yet, most capable and skilled tuners spend a lot of time working on and developing their own instruments with little time to dedicate to the extra workload of tuning other maker’s instruments. So, year after year I started to get more and more requests for tuning. Since I mainly tune for Saraz, I found I have more time than the average builder does to dedicate to tuning an array of instruments. 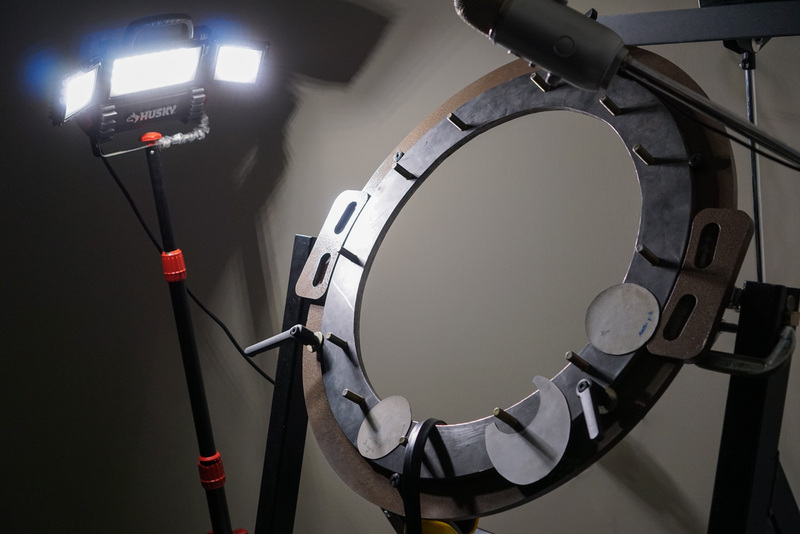 I started Rivera Steel Tuning so that I could not only offer this service that is very needed, but also to continue developing my understanding of how these instruments are built. With so many builders that have a vast array of approaches there is a wealth of knowledge hidden in each piece of steel that has helped me to learn a variety of techniques. What do you like the most about tuning? My favorite part of tuning is the “controlled chaos” factor. While every hammer hit has an intention, you don’t always know what the immediate result will be. Yet, with every swing, the metal starts to give you clues as to what it wants, where it wants to be struck, how hard, etc. It is like a game, in ways. Yet, the rules aren’t always the same so being adaptable and willing to think outside of your normal tuning patterns is key. This mindset is crucial when tuning instruments made by other builders than yourself. There are so many ways to build a note that sings. Being able to visually inspect and do light hits can help guide my tuning approach. I am a person who can easily get bored. Tuning instruments from a variety of builders never gives you a chance to get bored as it requires a lot of focus and critical thinking. It is both scary and exciting at the same time which is why I find it so dynamic. Also, taking an instrument from a displeasing sound to a pleasing sound is incredibly satisfying! What are the challenges you can face? Oooh, lots of them! One of them is understanding the way the metal was shaped to begin with. 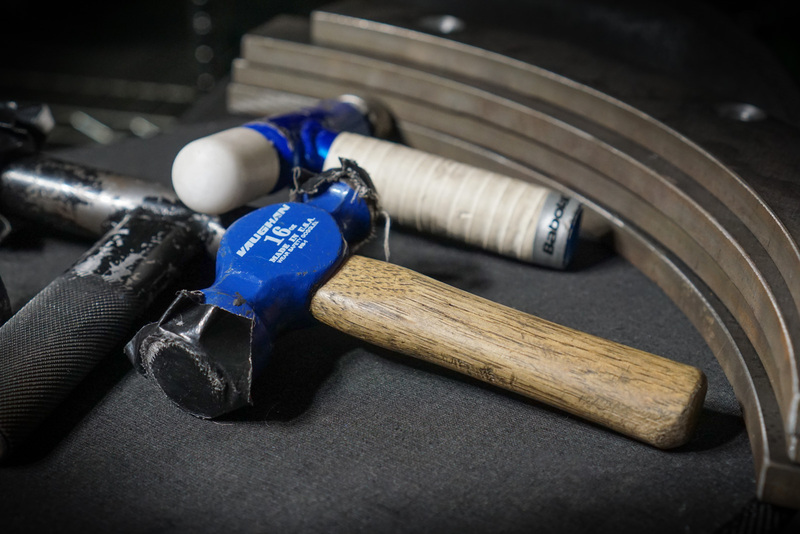 Whether it was drawn, rolled, hammer sunk, hydroformed, or spun, 1.0 mm or 1.2 mm will all play a significant role in the tuning approach as each method will have a different way of stretching and thinning the metal in various places. The way borders of notes are shaped also plays a key role. Some instruments are considered “borderless” while others have extremely defined borders. One request I often get from builders about tuning their instruments is “Don’t touch the borders”. So, when tuning an instrument it is extremely important to understand how a note should be tuned for that specific instrument as using the wrong method can result in changing the sonic character in a non pleasing way. Another challenge is dealing with instruments that need to be cut open to work on them. Having an instrument sent to me with dents and dings, or the glue deteriorating requires a significant amount of work to repair. 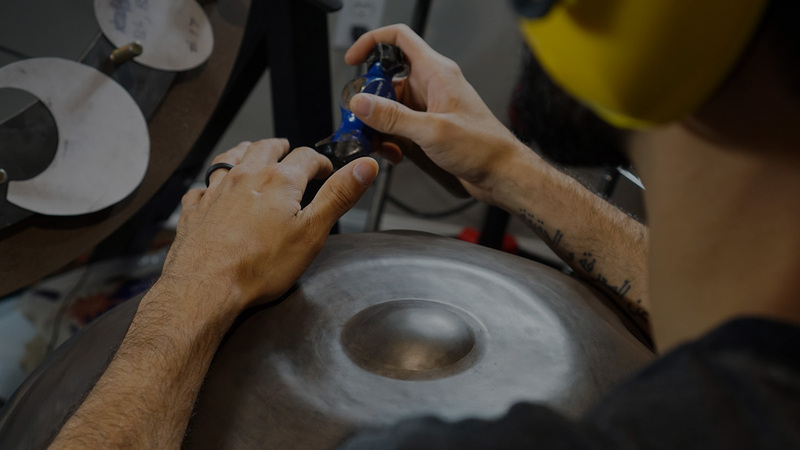 While that can be the most challenging aspect, and sometimes the scariest part of working on a handpan, it often tends to be the most gratifying upon completion. There are few things I enjoy more than taking on a damaged and out of tune instrument and making it sing again. The look on people’s faces when they first get to play their freshly tuned handpan is priceless! So how does it work if we have a detuned instrument? Quite simple! At least for the owner of the instrument. I have a quote form on my website where I request some information to help me give a more accurate quote of the work needed and cost to do so. I often prefer and request a short video, even if just a phone video, of all the notes being played individually. This helps me give the most accurate description of the work needed. After the quote is sent, the owner can either ship me the instrument or wait for me to be at a festival they are attending or that is near them. I have a festival schedule on my site as well. I always make a “before and after video” of the work I do. Once the video is sent to them letting them know the work is done I ship the instrument back as soon as payment is received. That’s it! On my end, for standard tuning I generally hold onto the instrument for a few days to ensure stability. Sometimes an instrument may need a couple of tunings before I see that it is stable. That can really all depend on the way it was built and if it was built by a skilled maker. For damaged instruments, if I have to cut it open for any reason the work may take a couple weeks as the glue for the instrument needs to cure for a time. 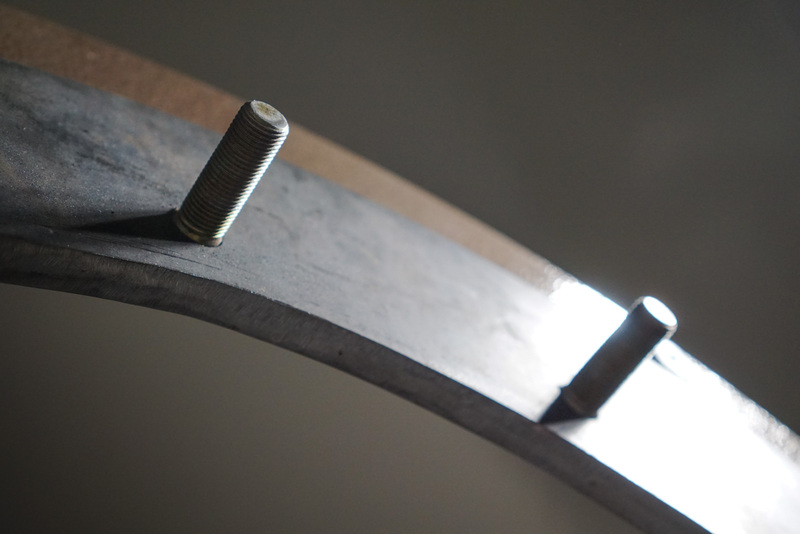 Damaged handpans will likely need a few tunings before stable enough to ship out. 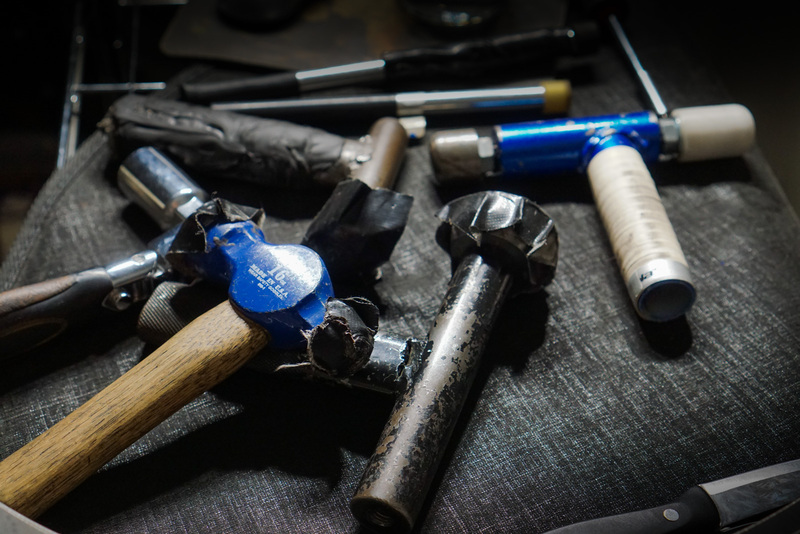 Which hammers and tuner do you use? I am still using the first hammer I ever bought and shaped for a majority of tuning. It was a cheap $12 ball peen hammer I bought from the local hardware store and have shaped and reshaped over a dozen times. Muscle memory and comfort are a huge part of tuning for me. So if I were to lose that hammer I would be quite sad! I also have some specialty hammers that based on the contour can be used for specific reasons. One of them is a Jimmy James hammer that I really like. For a few reasons, I like that one for tuning high partials as it seems to help make them stand out more if the note is choked up. There are a couple Rhythmical Steel hammers I use as well, often when there is interstitial work needed. I have a large wooden mallet that rarely gets used in the retuning world unless there is a port that may need some tuning. Also, a nice and flat headed Pantheon Steel hammer that I like to use on larger notes or while tuning an instrument in the tuning rings after it is cut open. I would be lost without GTune and LinoTune! The combination of the two makes for an incredible amount of precision and accuracy in the frequency alignment. I haven’t found myself needing any other program to tune after having used them for the last 5 years. Thanks for sharing your passion for the handpan with us and for the good sounds. Say hi to your lovely wife from me. See you soon!